Distant cousins you say? From my mother’s side? My 5 year old daughter is really into dinosaurs right now. I mean REALLY into dinosaurs. We read books, collect toys, watch dinosaur cartoons and she forces me to try to pronounce things like carcharodontosaurus or Velociraptor mongoliensis. So anything we find that we can read about these reptiles, we will. While she’s into dinosaurs, (could you ever have guessed?) I’m into chickens. I mean REALLY into chickens. 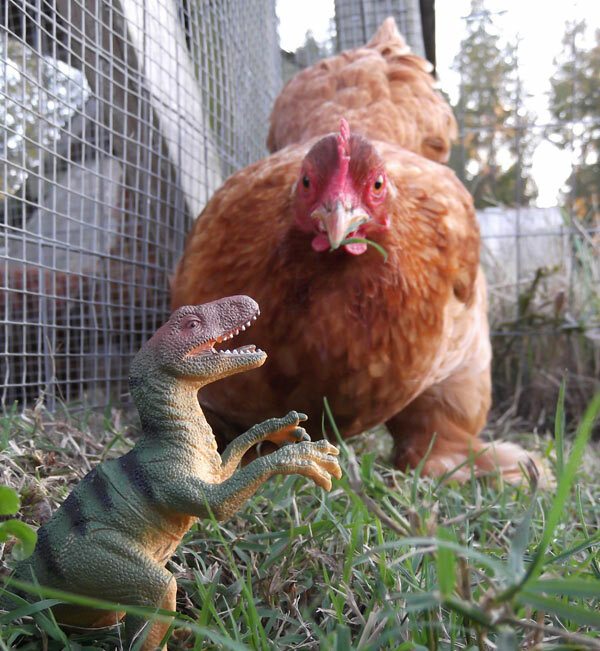 Dinosaurs and chickens–chickens and dinosaurs… chicken dinosaurs? Eureka! That thought reminded me about discussing in college the possibility that some dinosaurs eventually evolved into birds. Yes, possibly chicken dinosaurs! I really wanted to share this idea with the wee one, but I wanted a little more information. Jumping on the internet (thank you, Google) I found all sorts of fun references to studies and research regarding the idea that chickens may have evolved from dinosaurs! These articles about chicken dinosaurs—chickosaurus rex?—are going to blow her mind, I thought. And blow her mind they did! Her imagination ran wild instantly, and we had to spend the afternoon doing more research on dinosaur chickens, something we were both tickled to do. How cool to think that chicken ancestors once roamed the earth at the top of the food chain. How about that for irony? At first, I thought I couldn’t picture it… but seriously, have you seen a heavily molting chicken? Yeah, I guess I can picture chicken dinosaurs after all. My own daughter’s reaction to hearing about chicken dinosaurs was one of excited happiness: “We have dinosaurs in our backyard! ?” If you like chickens, as well as dinosaurs—or if you know someone who does—you may want to read a little more about this possibility so maybe you can fantasize that your backyard hobby of chicken keeping took millions of years of evolution for you to enjoy today. I have noticed that chickens run like the T-rex’s on television, now I know that it isn’t just a coincidence! It is so incredible that an apex predator may have evolved into a prey animal, I guess mother nature truly does have a twisted sense of humor. So you can imagine what dinosaurs tasted like; and vice versa. Hello! I am Eleanore and I know for a fact that the closest relative to the Tyrannosaurus rex are chickens yes it is supprsing but it is perfectly true all dinosaurs and birds evolved from tetrapods look them up on google! They cam BEFORE the Dinosaurs! I loved this article! The fact that chickens are our generations dinosaurs. When our chicks, well, “fledglings” were first set free from their run into the whole backyard, my husband and I would laugh because we thought they looked tiny velosoraptors(sp.)! Honestly, it made owning them even cooler to own! That toy velociraptor is inaccurate. In life, the family resemblance would have been greater, because velociraptors had fluffy feathers! Basically, if you saw one today, you’d think it was a flightless bird with teeth.